This year marks the 30th running of the Holy Bull Stakes (GII) at Gulfstream Park, the south Florida oval’s first major prep on the road to the May 4 Kentucky Derby. The 1 1/16-mile main-track test offers points to the top four finishers on a 10-4-2-1 scale. As of now, even a second-place finish in the race could put a runner in the hunt to make the gate for the Run for the Roses. Holy Bull, a son of Great Above and the Al Hattab mare Sharon Brown, was 1994’s Horse of the Year after a spectacular 3-year-old season that included wins in the Hutcheson Stakes, Florida Derby and Blue Grass Stakes on the road to the Derby. He finished an uncharacteristic 12th under the Twin Spires and, afterwards, it was hotly debated whether or not he was drugged, so much so that even his owner/trainer Jimmy Croll believed it due to the horse’s uncharacteristic poor performance. Fortunately his Derby run did not define his career, as he went on to win the Met Mile, Dwyer Stakes, Haskell Invitational, Travers Stakes and Woodward Stakes. He was also 1994’s champion 3-year-old. To racing fans, Holy Bull is one of the great grays of all time — he joined Native Dancer, Spectacular Bid, Winning Colors, Princess Rooney, Lady’s Secret and after a lengthy stud career at Darley at Jonabell in Kentucky, where he was a standout sire, represented by names like Confessional, Macho Uno and Giacomo, and is the broodmare sire to many top notch runners. He was inducted into Racing’s Hall of Fame in 2001 and died 18 months ago at the age of 26 at Jonabell, where he spent his entire post-race life. Since it was first contested in 1991 as the Preview Stakes (and renamed in 1996 for the 1994 winner), the Holy Bull Stakes has seen some good horses reach the winner’s circle, including Derby winners Go For Gin (1994) and Barbaro (2006). Other recognizable names to have won the race, which has been contested at various distances from a mile to 1 3/16ths miles, include Hal’s Hope, Offlee Wild, Nobiz Like Shobiz, Dialed In, Irish War Cry and Audible. It is the traditional prep for the Fountain of Youth Stakes (GII), set for March 2 this year. Hall of Famer Nick Zito has saddled the most winners of this race with three (Go For Gin; Suave Prospect,1995; and Dialed In, 2011), while the retired fellow Hall of Famer Jerry Bailey rode five winners, the most recent being Cape Town, 21 years ago. This year, ten are expected to go postward, most of which haven’t earned a single point toward making the Derby gate. The South Florida weather is set to be warm and drier than Friday by the time this race, which has been carded as the 11th and leaves the gate at 5:13 p.m. ET. 1. Garter and Tie – Owner/breeder Jacks or Better Farm won this race in 2001 with Radical Riley and are back this year with this Ralph Nicks-trained son of Brooks n’ Down. He’s made every one of his career starts over this track, only finishing worse than third once (fourth), with two wins, two seconds and two thirds. Nicks seeks his first Holy Bull victory and jockey Tyler Gaffalione makes his Holy Bull debut. 2. Federal Case – Undefeated in two starts, this son of Gemologist makes his stakes debut for Robert and Lawana Low. Trainer Todd Pletcher has two wins here — in 2012 with Algorithms and last year with Audible. He won his last, an optional claimer, over this track in December. Javier Castellano has won this race twice as well, both times on Pletcher’s winners. 3. Epic Dreamer – This Epic Racing-owned son of Orb makes his first start since he was sixth as the 6-5 favorite in the Springboard Mile at Remintgon Park last out Dec. 16. Neither trainer Kelly Breen nor recent Eclipse Award-winning jockey Irad Ortiz Jr. have ever won the Holy Bull. This colt has won his only start at this distance. 4. Everfast – Trainer Dale Romans has won more races than any other trainer at Churchill Downs, but has yet to win the Holy Bull at Gulfstream. He sends out this Calumet Farm son of Take Charge Indy, who has yet to win a race in five tries since breaking his maiden at first asking back in August. He has been training over the surface for more than six weeks. Jockey Chris Landeros has yet to win a Holy Bull Stakes. 5. Harvey Wallbanger – named for a fancy drink consisting of vodka, the Italian liquer Galliano and orange juice, this son of Congrats makes his first start against winners after breaking his maiden at Churchill last out and, therefore, his stakes debut. Trainer Kenny McPeek is in search of a good Derby horse and a first win here and uses Brian Hernandez Jr. looking for his first win in the race too. 6. 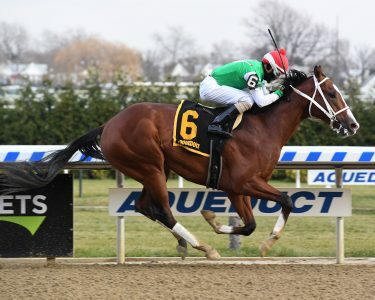 Mihos – This Centennial Farm-owned, $320,000 son of Cairo Prince is coming off a nice win over this track at a sixteenth of a mile shorter in the Mucho Macho Man Stakes three weeks ago. John Velazquez put together a Hall of Fame career since winning this race last in 1997 with Arthur L. and though trainer Jimmy Jerkens carries some strong genetics, he’s yet to win this race. 7. Come on Gerry – Romans’ other runner, who starts against winners for the first time after scoring by 2 ¼ lengths in wire-to-wire fashion at this distance here a month ago. Robby Albarado rides this winter at Gulfstream for the first time in a long time and will be aboard this well-bred son of Elusive Quality. 8. Maximus Mischief – the only runner here to have cracked the top 20 in Derby points, sitting in 10th position with ten points from his Remsen Stakes win last out. Jose Ortiz won this race aboard Upstart in 2015 for the late Rick Violette and rides this colt for the first time for trainer Butch Reid. 9. Gladiator King – is the most experienced runner here with eight career starts going back four months. He has a non-graded stakes score at Tampa Bay Downs to his credit and a couple of poor performances when jumping in class, and Jaime Mejia sends out his first Holy Bull starter here. 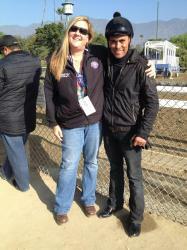 Carlos Montalvo rides for the first time, too. 10. Going For Gold – a maiden making his first start since being acquired privately by Loooch Racing, California-based trainer Bob Hess Jr. rolls the dice on this son of Atriedes. He picks up blinkers after a pair of close seconds in his only two starts in maiden company. Jockey Albin Jimenez rides in his first Holy Bull. Which Jockey Will Win the 2017 Kentucky Derby?